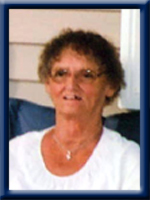 Whynot, Patricia Mona, 72, of Liverpool, Queens County, passed away on Thursday, September 12th, 2013, in the Queens General Hospital, Liverpool. Born in Halifax, she was a daughter of the late Russell and Florence (McDermott) Mortimer. Patricia worked at Mersey Seafood in Liverpool for many years until her retirement. She enjoyed spending time with her family, and watching her favorite T.V. shows. She is survived by a daughter Patricia (Wayne) Sunderland, of Liverpool, son Wayne Whynot, of Liverpool; grandchildren Kayla, Maria, Dean, Dwayne, Wayne; great grandchildren Emma, Bailey, Mason; sisters Florence (Paul) Duguay, of Quebec, Mary MacLean of Kingston, N.S. ; brother Russell Mortimer of Halifax; half brothers Peter Bourgeois, Tommy Bourgeois, both of Ontario. She was predeceased by her husband John “Jack” Whynot. Cremation has taken place under the direction of Chandlers’ Funeral Home, Liverpool. A graveside service to celebrate Patricia’s life will be held at 2:00 p.m., Wednesday, September 18th, 2013, from Trinity Anglican Church Cemetery, Bog Road, Liverpool. Reverend Judy Cross officiating. Family flowers only. Donations may be made to the Alzheimer’s Society of Nova Scotia. Online condolences may be made to the family at www.chandlersfuneral.com. Sorry to hear about your mom. I knew she wasn’t well for a while but now she is at peace and back with your dad. RIP Patsy till we all meet again. So sorry Patricia to hear about your mom. You were so good with her and took very good care of her . My thoughts are with you both at this sad time. so . sorry for your loss ,my prayers are with you at this time . We was sorry to hear of Patsy’s passing yesterday , though we knew she wasn’t well . Our thoughts are with the family near and far . So sorry to hear of your Mom”s passing….God Bless!!!!! Maurice & Betty Whynott,Mersey Place CT.
Patricia,Wayne an Family, So sorry for the loss of your Mom. She was a wonderfull lady and will be greatly missed.Prayers and deepest Sympathy to you all. So sorry to hear about Patsy.She was a very nice person and will be missed.Thinking of all of you and hope time will help you. so sorry for the lost of your mom she will be miss. our prayers and sympathy to you guys. I’m very sorry to hear about your mother.She was a good woman.May she rest in peace. Patricia and family, so sorry to hear of the loss of your mom, thinking of you at this sad and difficult time. My prayers and thoughts are with you and your family. Patrica, Wayne and families…..I was sorry to hear of your mother’s passing. I knew Patsy for 40 years. She was a good person who will be missed by her family and friends. Rest in Peace Patsy….say hi to Jack for me. So sorry for your sad loss, you gave your Mom the best of care and I know she appreciated it.Please except our most sincere condolences. Take care and know that others are thinking of you at this sad time. Our Thoughts And Prayers Are With You In Your Time Of Sorrow.Take Care. Sorry to hear about your mom Patricia. But she is at peace now. My thoughts are with you and the family. So sorry to hear of your loss, stay close and comfort each other in the times ahead and remember all the good times you had together. Patricia we are so sorry to hear of your mother’s passing. We were glad we were able to see her in the hospital. Better days are ahead, but for now we know the sorrow overwhelms you. Let the memories flow freely and the good ones shine through. Sorry to hear about your Mom. I remember working in the fish plant with her. She was a nice lady. Keep your memories close to your heart as they will comfort and support you. May God bless you all.